Ishatai claimed to have communed with the Great Spirit, and he successfully predicted the appearance of a comet, to be followed by a long summer drought. 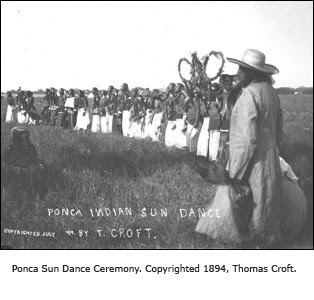 He succeeded in gathering all the Comanches together—a feat which the great chiefs had never been able to do in the past—to perform the Sun Dance, in which all but one band, the Swift Stingers, joined. This was a wholly new venture for the Comanches, although they had watched the Kiowa sun dances and those of the Cheyenne for many years. A buffalo herd was captured, and a buffalo was killed, stuffed, and mounted on a pole. Mud-men clowns (imitated from clowns seen among the Pueblos) provided 'a light hearted gesture in an act of desperation—the inauguration of the Sun Dance for the earthly salvation of the Comanche way of life'. A mock battle was fought, and the people danced in bands for five days before the sun dancers themselves danced, drummed, and sang for three further days, doing without food and water for the duration of the dance. Ishatai had promised that he would share his immunity with others, and that they should drive the whites from the land and restore the old way of life. But in the action they mounted against a post at Adobe Wells, soon afterwards, nine Comanches were killed. Ishatai lost his power, and the Comanches, their spirit broken, entered the reservation in 1875.